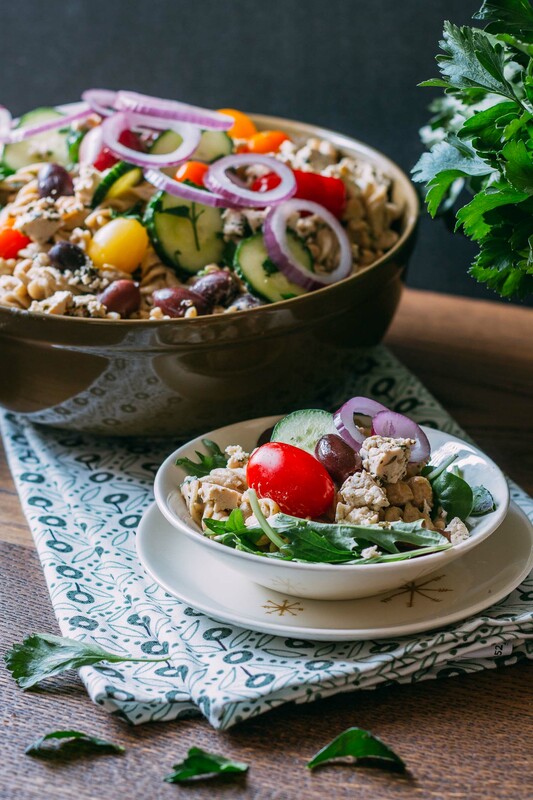 Greek Chickpea Pasta Salad is my take on traditional Greek salad. And making this deliciously nutritious salad it is as easy as it gets. Made with hearty ingredients like gluten-free rice pasta and dairy-free feta cheese, this salad is a meal itself. And here’s a bonus, I’m not the only one who likes it; it’s a real crowd pleaser! Greek Chickpea Pasta Salad is a perfect dish to make fantastic use of fresh summer veggies. Refreshing cucumbers, sweet tomatoes, and lovely red onions make each bite come to life. It’s the crisp crunch of the vegetables against the gentle texture of the noodles and tang of the feta that makes for an incredibly pleasing taste combination. In fact, ever since I started making this salad with its flashy bites of tangy feta, my daughter asks that we make it time and time again. The ingredients in this recipe are ones that I’ve been throwing together for years. But never before have I combined them with homemade Dairy-Free Tofu Feta Cheese, which I must admit, is the real show stopper in this Greek Chickpea Pasta Salad. Tofu feta is the best feta I’ve ever made. It’s also the first plant-based feta I’ve ever made which should tell you a little bit about how easy it is to make dairy-free feta. It’s time I let you in on a little secret. We like to make this salad for dinner and then scarf down the leftovers for lunch in the following days. 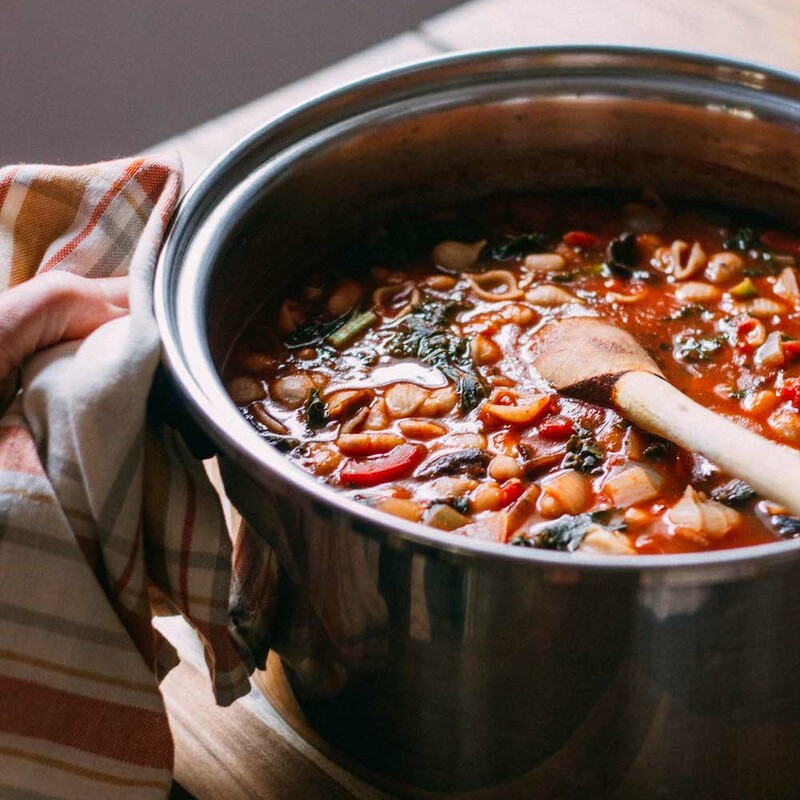 This generous recipe intentionally makes plenty for leftovers as lunches. Making significant quantities of favorite dishes is my BIGGEST healthy eating secret. My answer to making healthy food choices for busy times of the day such as lunch – leftovers! Anyhow, as I was saying before I went into the benefits of leftovers bit, my family and I crave this salad! And I’d better warn you; this stuff is practically addictive or something. After one deliciously chewy tangy and savory bite, you immediately wish for another. So a funny thing happened on my way to writing the zesty dressing recipe for this salad. Given that I do what I do, I read about different foods and cooking techniques often. And given all of this foodie research, I suppose it was inevitable that I would eventually come across this new way of using an old ingredient called aquafaba. Aquafaba sounds oceany to me, but it has nothing to do with the ocean or sea vegetables or anything like that. Aquafaba is the bean broth that leftover when you drain a can of chickpeas. That’s right; the stuff we have typically poured down the drain is now a trendy ingredient! It seems that the starchy liquid serves as a great binder, just as it is, straight from the can. But what really makes this former throwaway impressive is that it whips and creates a foam comparable to egg whites! 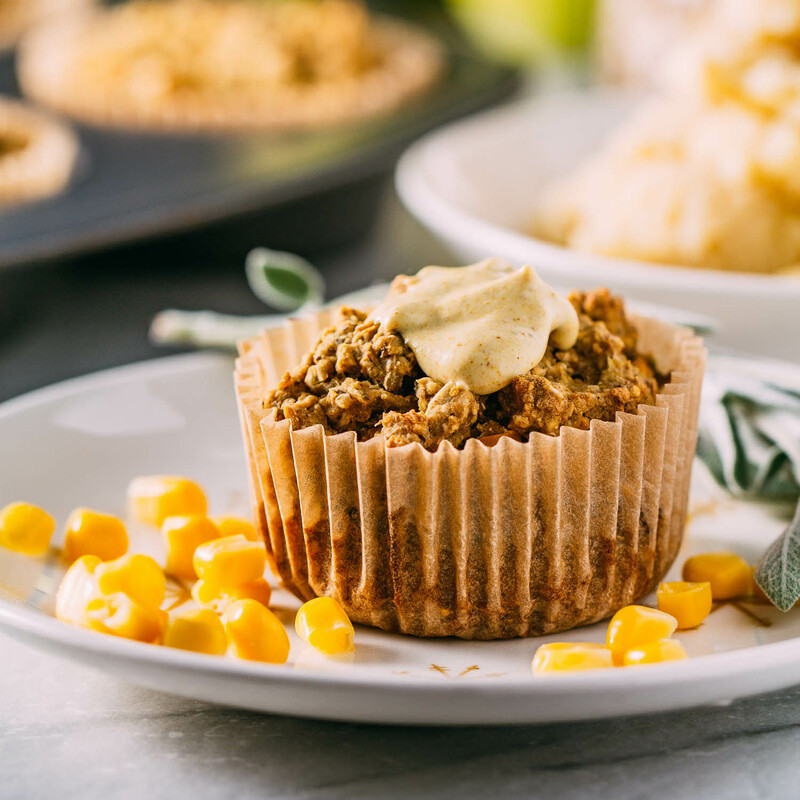 That whippable quality means that Aquafaba can trap air, giving ingredients structure at the same time it delivers a fluffy lift. So what role does aquafaba play in my recipe for Greek Chickpea Feta Pasta Salad? It’s the dressing base and binder to the entire salad. I am proud to share that it combines and carries the dressing ingredients, beautifully! So much so that I know I will be returning to the wonders of aquafaba for future recipes. As it turns out, aquafaba is not a throwaway after all. In fact, it’s a real keeper! First, it’s expectantly refreshing with its crisp garden veggies, chewy, satisfying pasta and tangy homemade feta. We deserve a salad that tastes SO good! Second, it’s such a simple recipe that you can make it on busy days when your time is in a real crunch. Providing that you have a batch of my easy-peasy homemade Vegan Herbed Tofu Feta waiting patiently in your fridge, this salad only takes as long to make as it does for your pasta to soften. Now, that’s fast! 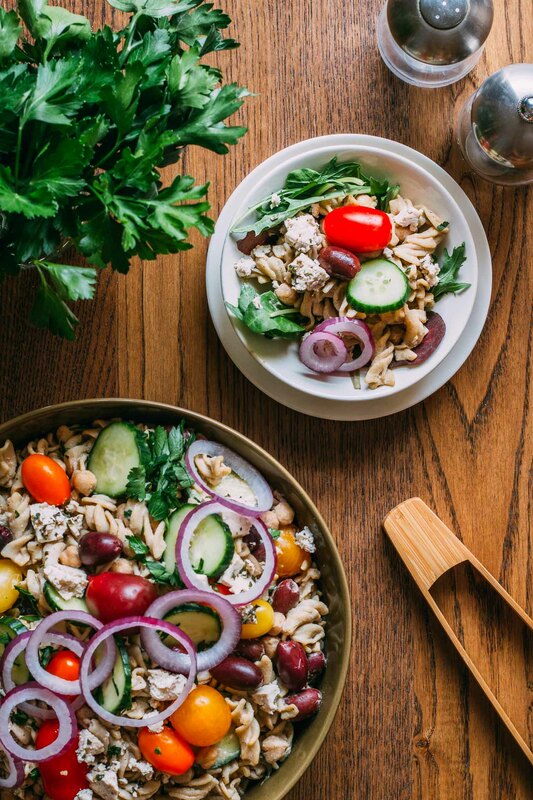 Finally, Greek Chickpea Pasta Salad is hearty and nutritious! Be sure to check the nutrients provided at the bottom of the recipe. You are bound to be impressed. 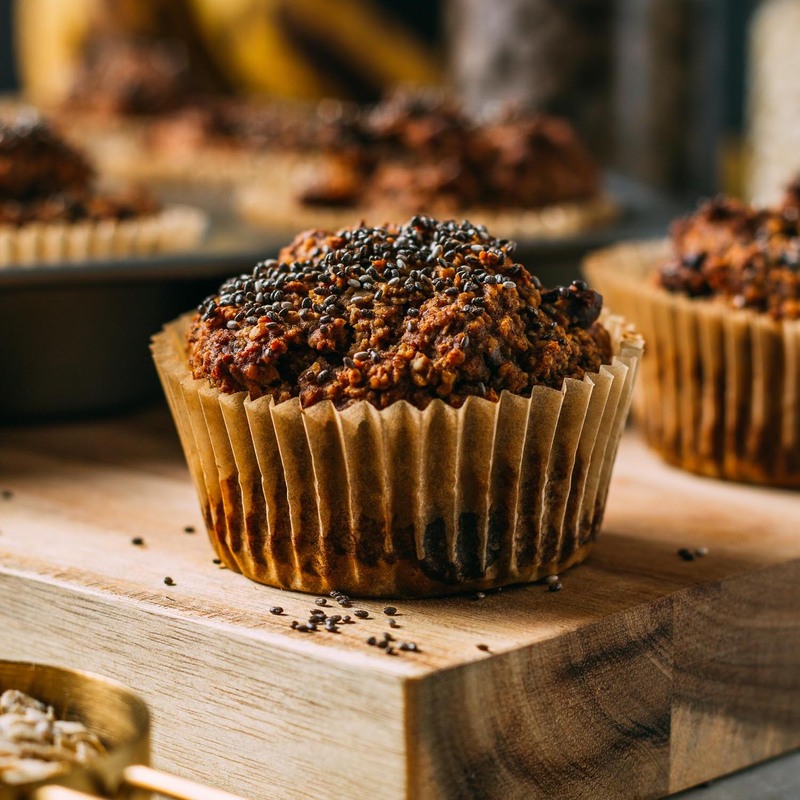 Once you’ve tasted this deliciousness for yourself, leave a comment and let everyone know how it turned out! Oh, and one last thing; the orange colored ingredients in my recipes mean they’re available for purchase through Amazon. Just click the orange words to read more about that ingredient and buy, if you like. I offer this as a value to my readers when I find particularly good bulk deals or when an item may be unfamiliar or even hard to find in some parts of our lovely world. 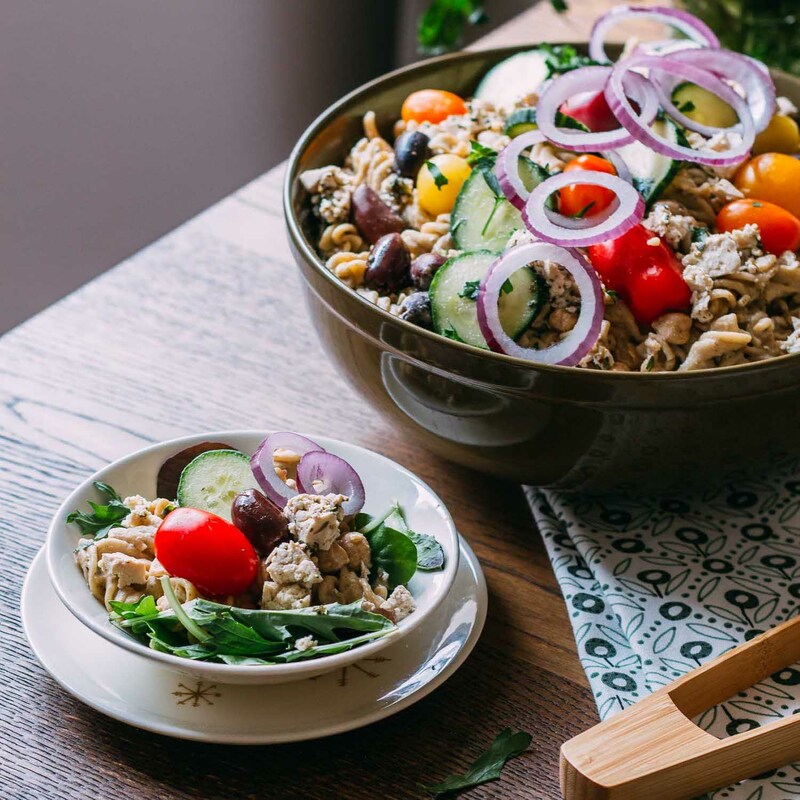 Filled with a variety of fresh herbs and other flavor-filled ingredients, Greek Chickpea Pasta Salad will delight your senses! Serve Greek Chickpea Pasta Salad atop a pretty plate of leafy spring greens, as a side salad at your next cook-out, or even stuffed inside your favorite wrap! Right now, go ahead and make a batch of homemade Dairy-Free Tofu Feta Cheese, so you’re all set to make this pasta salad in the time it takes to cook the pasta! 2 cans of chickpeas, liquid reserved - This bean liquid is what is referred to as "aquafaba." 4 tbsp vinegar such as Braggs Apple Cider Vinegar, white wine vinegar or balsamic vinegar - We used balsamic in ours. Since it makes such an excellent contribution to this recipe, to begin, be sure that you have stirred together a quick batch of Dairy-Free Tofu Fata Cheese. First, now that you are sure that the cheese is already marinating prepare your pasta according to package directions. While the pasta is cooking, add each salad ingredient to your salad bowl, chopping items as instructed above. Be sure to reserve the bean liquid (aquafaba) for later use in the dressing. Next, place all of the dressing ingredients in a high-speed blender and blend until creamy. Taste and adjust the seasonings to your preference. If you like things sweeter, add another date. Drain the prepared pasta and add it to your bowl with the rest of the prepared salad ingredients. Pour the blended and seasoned salad dressing over everything and stir to distribute evenly. Garnish this eye-catching salad with lovely rings of red onion and sprigs of parsley. Serve as the main entree along with a wedge of your favorite bread or a few wonderfully seedy crackers. A batch of warm gluten-free homemade corn muffins tastes terrific with this Greek salad. If you know that you'll be serving your incredibly tasty Greek Chickpea Pasta Salad right away, you can opt to slice the tomatoes in half to distribute a bit of tomato throughout the salad. On the contrary, if you want your pasta salad to hold up a while longer, leave the tomatoes whole. 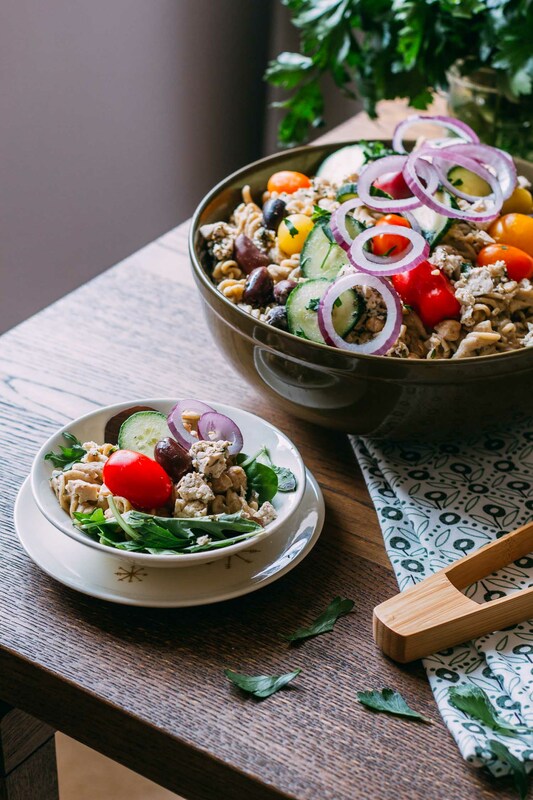 The nutritional information provided below is for this Greek Chickpea Pasta Salad without the feta since the feta is in a separate recipe post. 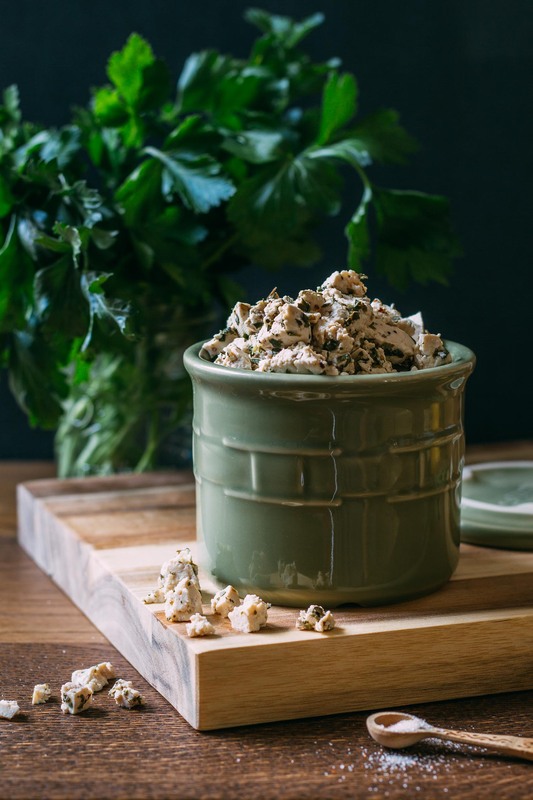 For the nutrients in the Dairy-Free Herbed Tofu Feta recipe, kindly refer to that individual recipe post.